Attempts to change the world by radical means and explosives have been tried for centuries. A great deal of blood is usually shed in this struggle. Meanwhile, everything changes and so are the regime-toppling technologies. Color revolutions in Georgia and Kyrgyzstan plainly show that the properly indoctrinated youth is no worse than TNT in terms of destructive potential. Kazakhstan was spared revolts and takeovers by mob, but ideas like these were entertained in it too. Some observers even indicated the organizations that could, in theory, take up arms to foment a revolution. Socialist Resistance of Kazakhstan, a movement headed by Ainur Kurmanov, is one of them. Graffiti of the sickle with hammer and socialist slogans "Power to the people", "We want free education", and suchlike appeared in the center of the city of Taraz not long ago. All of them were signed "SocRes" which clearly stands for Socialist Resistance of Kazakhstan. It was an action mounted by the Taraz regional organization of the nationwide radical youth structure. Socialist Resistance web site immediately reported the Taraz action. "SocRes activists arranged an action and left graffiti all over walls, fences, and windowpanes in central Taraz," one Leonid Jambulsky wrote. "On the eve of May 1 last year, the Jambul SocRes organization left graffiti all over the center of the city but they lasted only five hours and were painted over. This time, our city was decorated with the sickle-and-hammer emblem signed SocRes and slogans "Bourgeois happiness means workers' blood", "Education must be free", "We stand for Socialism", and others. Should the police try and do something about it, the effort will take them more than a day." "Initially, these guys are from the youth wing of the Communist Party," akimat or city administration official explained off the record. "They number only 13 in all of the country. The bastards should be hunted down and eliminated, if you ask me." Taraz activists of Socialist Resistance remain cautiously out of the spotlight. Try as he might, this correspondent never managed to contact or meet even one of them. Modern technologies offered by Internet came in handy. "Sure, we aspire for a revolution but a revolution in mass consciousness, in their evaluation of socioeconomic situation in the country," Kurmanov replied via e-mail. "We are not conspirators trying to artificially initiate some sort of processes behind the back of the people. We view our mission as that of enlightenment. We have never entertained any military plans like let's topple the government in a year." Socialist Resistance of Kazakhstan is not exactly young. Its ideology was formulated by activists of the Young Guard of Kazakhstan, an organization that stirred all of the country in the last years of the 20th century. Social Resistance leader assembled romantic intellectuals - fans of Che Guevara and Lev Trotsky - around himself. On the other hand, SocRes Internet forums these days do include aggressive postulates like "Socialist ideas are good for civilized society. Molotov Cocktail is the best religion in our banana republican jungle." Socialist Resistance of Kazakhstan arranged a conference in Bishkek (the capital of Kyrgyzstan) in 2006. It was attended by SocRes activists from Alma-Ata, Aktobe, Karaganda, Taraz, Uralsk, and Ust-Kamenogorsk, functionaries of the Committee for Working International (London, Great Britain), and guests from the Communist Party of Kyrgyzstan. Letters of support from working movements of Brazil, Sweden, Portugal were read aloud at the conference. Political and economic situation in Kazakhstan was reported and discussed at length. Delegates of the conference aired seditious ideas that the president could not control the situation and was himself the source of instability. The conference ended with adoption of the resolution defining principles and demands of Socialist Resistance (free education and health care services, development of trade unions, return to the previous system of pensions and previous retirement age, nationalization of factories, abolition of presidency, and some demands from the sphere of political rights and freedoms). Central Committee of Socialist Resistance of Kazakhstan met in Alma-Ata this year. Delegates from regional organizations and representatives of youth organizations from Kyrgyzstan were present at the meeting. The latest SocRes public action left the usually tranquil Taraz in turmoil only recently, on July 16. 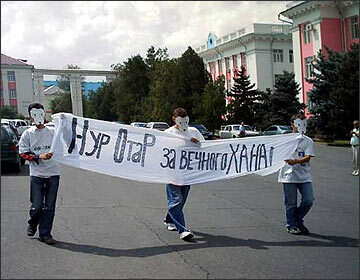 Three young men calling themselves "monarchists from the Nur-Otar party" [a distorted name of the president's Nur-Otan party; "otar" stands for a herd - Ferghana.Ru] marched with placards to the local Nur-Otan office. The protesters wore sheep masks and T-shirts bearing legends "Nur-Otan for the eternal Khan" and "Khan - the father, anarchy - the mother". Several journalists accompanies the young provocateurs. The "sheep" were brutally herded out of Nur-Otan office. SocRes is not particularly active which is ascribed to shortage of activists and meager finances. International Center of Socialist Resistance abroad does transact certain sums whenever it can, barely sufficient to permit the organization to remain afloat. Young socialists in Kazakhstan count on romanticism more than on common sense, but they do exist and dismissing them from the political equation will be a mistake.